Henbit weed is an upright (but sometimes horizontally lying) winter annual in the mint family with weak, square stems, fibrous roots and hairy, petioled lower leaves and sessile upper leaves. Often confused with speedwells, dead nettle and ground ivy, it sports purple, tubular, two-lipped flowers that form on the upper leaves. Henbit weed flowers in early spring, and its seeds mature from April to June; it's spread by seed and is found throughout the United States. Henbit weed prefers cool, moist soil and thrives in newly seeded areas as well as amidst thin or dormant grass. Maintaining a thick, vigorous lawn is important in the prevention of henbit weed. Mow your lawn regularly at a high setting, ideally 2-1/2- to 3-inches long, to discourage the presence of henbit weed. Mulch helps prevent the growth of henbit weed by blocking the sun it requires to sprout and grow. To cultivate soil with henbit weed, pulling or raking out plants is an effective approach. Henbit weed is most effectively controlled during the seedling to flower stage of growth. Control henbit weed by lightening soil conditions and improving drainage,particularly in shaded areas. Select a species of turfgrass that thrives in shade in order to promote dense, vigorous turfgrass. * Choose a selective post-emergent herbicide (dithiopyr, isoxaben, pendimethalin or prodiamine) in fall or a broadleaf weed herbicide with dicamba to tackle henbit weed. Be sure to follow directions carefully,especially when treating newly seeded areas. Heavy infestations can be controlled with triclopyr + clopyralid, 2,4-D or a 2,4-D combination herbicide during or before flowering. * To prevent the spread of henbit weed in gardens, apply a layer of mulch that's at least 2 inches thick to discourage growth. Alternately, vegetable and flower gardens benefit from an application of organic materials, such as wheat straw, grass clippings or mulched leaves. A method of organically controlling crab grass is to burn the young plants with a handheld weed torch. Typically a small control knob regulates the flame size and intensity on the onboard propane canister. Most handheld weed torches are small and easy to manipulate in a garden area or small lawn. An advantage of using a weed torch is that you can concentrate the flame on the crab grass for a few seconds, and it will begin to wilt and die immediately. Insert the propane or butane canister onto the weed torch. Various models use either of these types of fuel. Follow the manufacturer's instructions for installing the gas canister and lighting the unit. Adjust the torch to get the smallest, hottest flame. Typically, the bluer the flame, the hotter it is. Hold the flame on the crab grass just long enough until the plant shows signs of wilting. In most cases, with the flame adjusted correctly, it will take 3 to 4 seconds. Check the area 24 hours later. The plants should be extremely wilted, if not brown and dry. Apply the weed torch to any crab grass that has not fully dried out. It will take a little practice with your particular brand of weed torch, as the output on various brands different in both heat and flame size. Rinse out a garden sprayer with water to remove any residual herbicides, pesticides or fertilizers that may be in it. Fill the tank about 10 percent full with water and spray it until the tank is empty to ensure the hose is clean as well. Fill the garden sprayer with a 2,4-D herbicide. Depending on your particular product, you may need to dilute it with water, so read the application instructions. Spray the herbicide directly on the goat weed until it's thoroughly wet and let it soak in. Check the goat weed 48 hours later to ensure it's either dead or wilting. Apply more herbicide if the goat weed still appears to be healthy. It may take multiple applications to kill off the weed. Ground ivy weed,also referred to as creeping Charlie,is a fragrant, hardy perennial evergreen with creeping, blocky stems of varying length, leaves that range from dark green to purple and funnel-shaped, blue-purple flowers. Rhizomes occur and fibrous roots can be found at the base of nodes. Although native to Europe, this member of the mint family has since found a home in North America.Once prized for its medicinal properties in ancient Greece and Rome, ground ivy weed was used to treat ringing ears and inflamed eyes. It also was believed to be a helpful diuretic, astringent, tonic and gentle stimulant while treating kidney diseases and indigestion. Primarily a weed of turfgrass, ground ivy weed prefers moist, shaded areas but also can thrive in part sun. It's an aggressive weed that can survive even in poorly drained soil. Maintaining a thick, vigorous lawn,especially in shaded areas,is a good idea. When selecting grass, fine fescues like creeping red, chewings, hard and sheep fescue are preferred. Avoid over-fertilizing; an annual nitrogen rate of no more than 1- to-2 lbs. per 1,000 square feet is advisable. 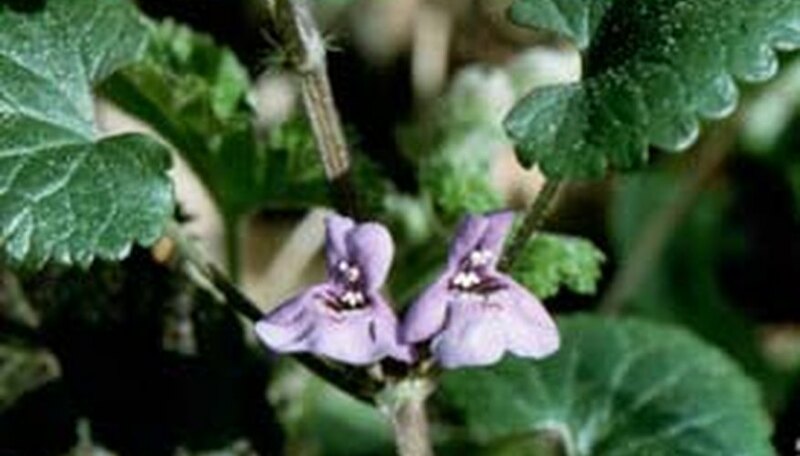 Hand-pulling ground ivy weed is one method of control. The weed can easily be pulled from wet soil; it is integral that the entire root system is removed, so grab the root system as close to the soil line as possible. Plan on pulling weeds each month from spring to fall, digging up large bunches with well-established roots. 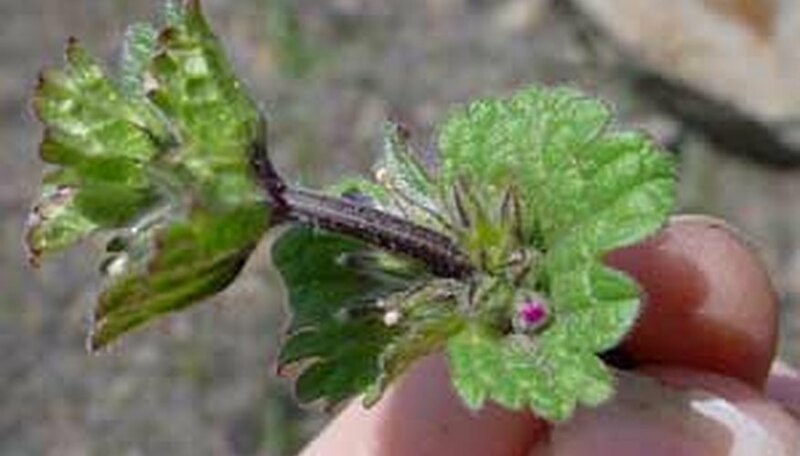 Typically, three seasons of diligent pulling is required to control the presence of ground ivy weed. The invasive weed can be killed by spraying it with glyphosate-based, or three-way broadleaf, herbicides. Those containing 2, 4-D, mecoprop or MCPP,as well as dicamba,provide the best control against ground ivy weed. Herbicides with triclopyr also might work. Herbicides should be applied in fall near the first frost or in spring when the weed is in bloom. To prevent the spread of ground ivy weed in gardens, apply a layer of mulch that's at least 2 inches thick to discourage growth. Alternately, vegetable and flower gardens benefit from an application of organic materials, such as wheat straw, grass clippings or mulched leaves. 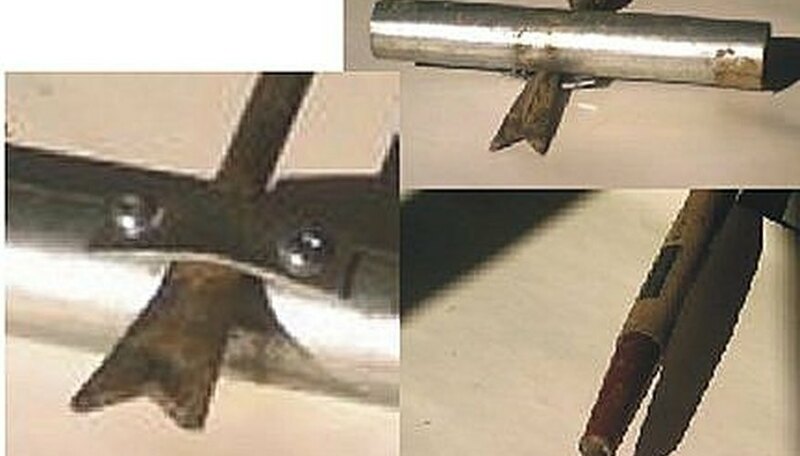 This picture shows modifications made to the business end of the tool. The pipe is for several things. It gives a rolling surface to pry against in order to lift up the weed from it's roots. It also gives a place to press down with the foot. It also allows the tool to be tilted sideways thus lifting the weed and it's roots another way. 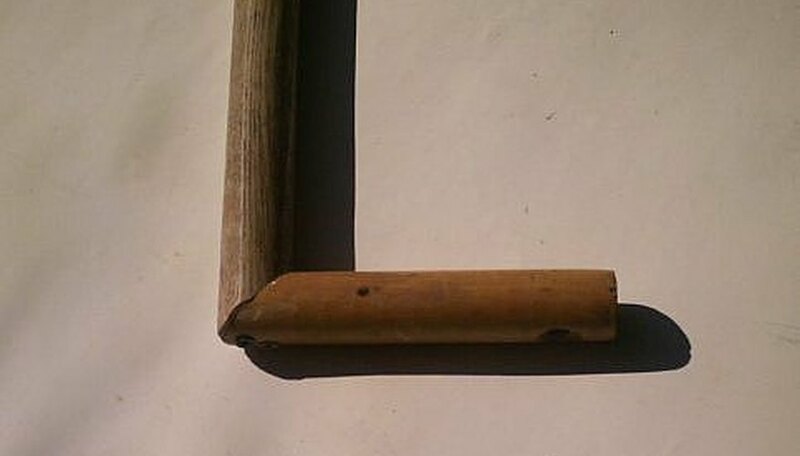 Shows the handle modification which adds a small portion of a handle. This gives a lever arm to be able to twist the thing sideways. This shows it pulling up a weed by levering it up and out of the ground. This is done by just swinging the handle down and letting it revolve around the pipe. The pipe gives it a fulcrum point and something to push against. This shows a foot pressing down on the cross pipe. 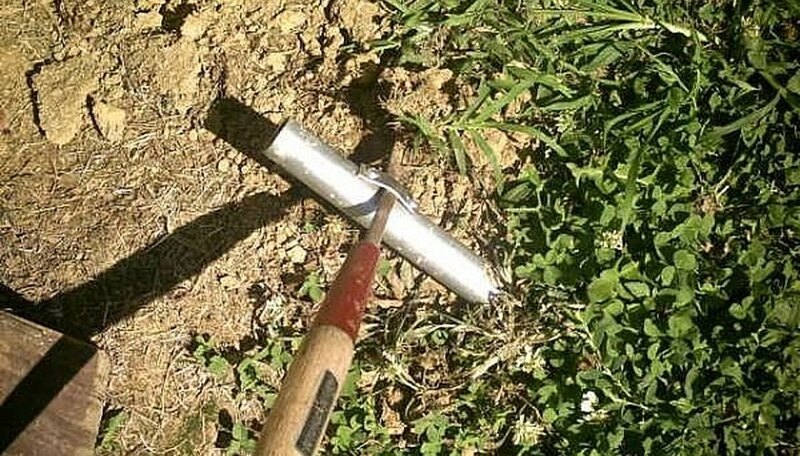 Sometimes this feature is needed if the ground is hard and it's hard to get the tool in the ground far enough to be able to pry the root up and out. 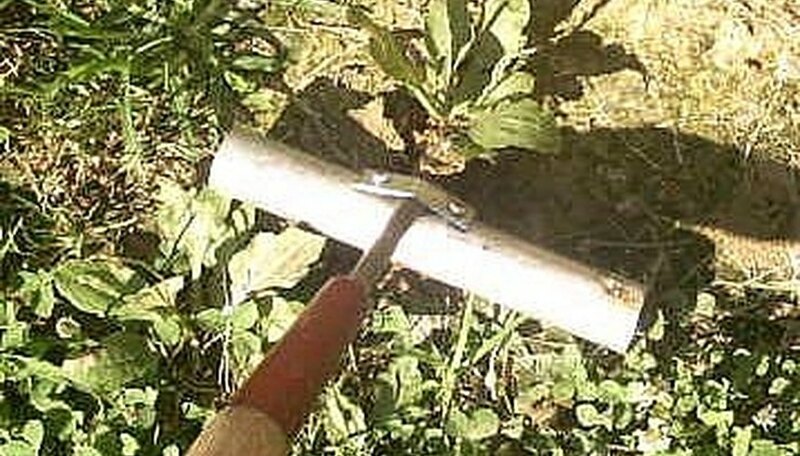 This shows the tool twisting and lifting the weed out of the ground. This is where the modification to the handle is a must. It gives you something to twist with. 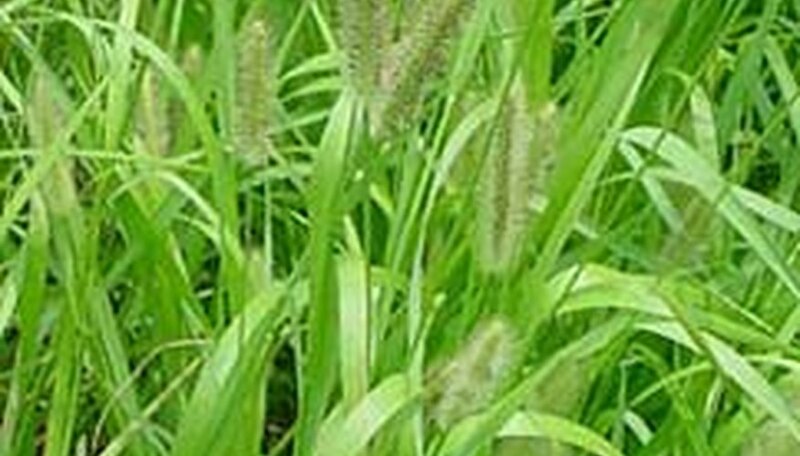 Foxtail is a tufted, upright, annual grass with a shallow root system. Its seeds germinate from late spring to fall, growing quickly enough to shade flowers and vegetables. Able to reach heights of up to 5 feet, tough, clumpy foxtail weed sometimes is confused with crabgrass. Foxtail weed can be distinguished by its furry, bristled seed-heads. Its root system releases natural herbicides that can prevent nearby plants from flourishing. Foxtail weed thrives in moist, fertile soil during the mid- to-late growing season. The seeds of summer annual grasses fall to the ground the previous fall, germinating the next year. Germination is based on soil temperature and occurs between 55 and 60 degrees. Warm temperatures and plentiful water fuel growth of foxtail weed. The annual grass then produces thousands of seeds from midsummer through the early fall. One of the most effective ways to address the presence of foxtail weed is to maintain dense turfgrass. Mowing regularly at a high-height setting helps to prevent seed germination. Mow bluegrass, tall fescue, fine fescue, ryegrass and the like at 2 1/2 to 3 inches throughout summer. Its height prevents the sort of bright light seeds need to germinate.Nitrogen fertilization can help prevent and manage the presence of foxtail weed. Applying a layer of mulch to your garden that's at least 2 inches thick helps to discourage the germination and growth of foxtail weed by preventing light from seeping through. Alternately, vegetable and flower gardens benefit from an application of organic materials, such as wheat straw, grass clippings or mulched leaves. The majority of young weeds simply can be pulled from soil, but remember that it's essential to remove the entire root system. In the case of particularly weedy areas, cover the ground with several sheets of newspaper, and top it with 3 inches of organic mulch. * Applying a re-emergence herbicide containing pendimethalin the following spring can help to alleviate the problem. Grass clippings or other materials that may contain the seed heads from foxtail weed should be disposed of and never used as compost. Identify the turfgrass in your lawn. Proper dilution of Fertilome Weed Out depends upon the grass variety. Mix Fertilome Weed Out to treat 250 square feet of St Augustine grass or centipede grass with a hose-end sprayer by adding 1/2 oz. of Fertilome Weed Out concentrate to 1 gallon of water. Mix Fertilome Weed Out to treat 250 square feet of Bermuda grass, buffalo grass or bentgrass with a hose-end sprayer by adding 2/3 oz. Fertilome Weed Out concentrate to 1 gallon of water. Mix Fertilome Weed Out to treat 250 square feet of bluegrass, zoysiagrass or fescue with a hose-end sprayer by adding 2/3 to 1 oz. of Fertilome Weed Out concentrate to 1 gallon of water. Consult the product's label instructions for treating larger areas. Wait to mix and use your Spectricide Weed Stop on a day when the wind is less than 10 mph. This will prevent the herbicide from drifting and landing on plants you didn't intend to kill. Make sure no rain is forecast for four to six hours after application. Measure and pour Spectracide Weed Stop into your garden sprayer. Add the gallon of water to the garden sprayer. It will mix naturally with the Weed Stop, but you can also give the container a little shake. Spray the weeds with your garden sprayer. You will have enough solution to cover 250 sq. ft.
Rumex acetosa, or garden sorrel, is a perennial weed that is often used in salads and as an herb. The leaves on this plant are arrow-shaped, and the flowers grow in burnt red cylindrical clusters. It flowers in mid-spring, and grows about 20 inches at its top height. Its leaves have also been used medicinally. Sorrel grows in soil that drains well. It can be in full or partial light. Sorrel does need iron-rich soil to grow. Its flowers will bloom in mid-July. Garden sorrel prefers damp soil, although another commonly grown variation, French sorrel likes dry, open spaces. Sow seeds in March, about 6 inches apart. When the first branches grow in mid-July, trim them back so that the plant will grow new leaves, which will taste better. Like most perennials, the roots are not terribly difficult to remove. If you want to remove sorrel from your garden, you should water the soil and remove them by hand while the soil is moist, as the roots aren't as difficult to remove when moist. Make sure you get the entire root system. If you need to use a fork to slip in under the plant, do so. 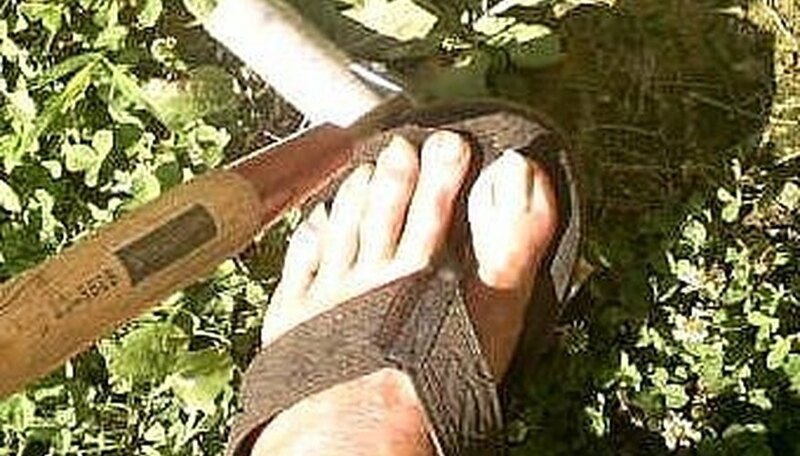 You can also cultivate with a sharp hoe. Once the roots and leaves are chopped up, most young plants will die. Return after two days to pull any plants that started to grow. If you see adult plants (the mature plants have flowers), it's a good idea is to place a plastic bag over its head before removing,this will prevent the seeds from dispersing. Pulling and reducing seed production will work for controlling sorrel. So, too, will a broad-spectrum herbicide that affects the plant systemically. Please keep in mind that systemic herbicides may take longer to be effective. However, the end result will also last longer. Capsella bursa-pastoris, or Shepherd's Purse, has basal leaves, or leaves that form at its base, that resemble dandelion grass. Small white clusters of flowers grow on tall, erect stems from around March until the next frost. Seed pods form on these stems, too. They are heart-shaped. Shepherd's Purse is easy to recognize. Interestingly, tinctures and teas made from this weed are thought to stop hemorrhaging and may help with diarrhea. A homeopathic website may have more information about its benefits. Here, we help you get it out of your garden. Shepherd's Purse is a winter annual. It is not strong enough to grow where good healthy grass already exists. It is more likely to grow in an area of soil where grass was damaged in the summer, and did not grow back by fall. If seeds fall on rich, loamy soil where no plant grows, it will grow there. However, once sod or flowers are present, the weed will generally not grow there. If you see young Shepherd's Purse plants, you should water the soil and remove them by hand while the soil is moist, as the roots aren't as difficult to remove when moist. Make sure you get the entire root system. If you need to use a fork to slip in under the plant, do so. You can also cultivate with a sharp hoe. Once the roots and leaves are chopped up, most young plants will die. Return after 2 days to pull any plants that started to grow. If you see adult plants (the mature plants have flowers), it's a good idea is to place a plastic bag over its head before removing. This will prevent the seeds from dispersing. An adult plant can disperse almost 50,000 seeds. Unfortunately, there are some strains of Shepherd's Purse that are resistant to various herbicides. When you shop for an herbicide, make sure it names Shepherd's Purse specifically on the label. Apply the herbicide during spring as the plant is growing. Check back again in the fall, and apply to any new growth. Lamb's quarters weed, is a member of the goosefoot family and is common throughout North America. It's a rapidly growing summer annual with dense clusters of miniature flowers found at the tips of the main stem and branches; it's also distinguished by rounded or triangular white-scaled, dull, blue-green leaves above that often are purple below. Depending on the amount of moisture the area receives and how fertile the soil is, lamb's quarters weed can reach a height of 6 feet and can be found anywhere soil has been disturbed. Lambquarters weed prefers rich soil and can most often be found in vegetable gardens, along roads and in open fields. Lamb's quarters weed, when young, can be controlled by cultivating plants with a sharp hoe or spraying them with an organic herbicide. Older plants can be pulled, but this should be done when the spoil is moist. Lamb's quarters weed needs bare, loose soil in order to become established, so it's commonly found in compost piles, newly established turfgrass, waste areas and fallow fields. Regular mowing and maintenance helps to control and,within a month or two,eliminate lamb's quarters weed.Applying a layer of mulch to your garden that's at least 2 inches thick helps to discourage the germination and growth of lamb's quarters weed by preventing light from seeping through. Alternately, vegetable and flower gardens benefit from an application of organic materials, such as wheat straw, grass clippings or mulched leaves. Mulching, pulling, tilling, hoeing and preventing the weeds from going to seed are the best methods for controlling lamb's quarters weed, which has a short, branched taproot and therefore is easily removed. 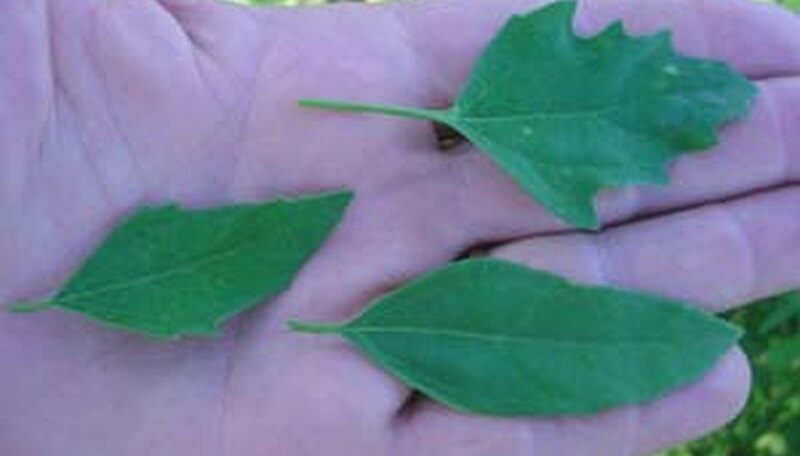 If you are having trouble removing lamb's quarters weed or it breaks off at the crown when pulling, slide a kitchen fork, dandelion weeder or other garden tool beneath the weed, prying it while pulling the weed up and out of the soil. * Pre-emergent herbicides, such as trifluralin, can be used to prevent germination of seeds; post-emergent herbicides like 2,4-D, MCPP and dicamba also are effective at combating lambquarters weed. Or, you can try using an organic herbicide that contains acetic acid or clove oil. Determine the size of the flowerbed area. Measure total square feet or estimate the size of the garden when completely planted and in bloom. Decide on what type of weed mat barrier will best suite the needs of the project. Some use mulches, whether organic or plastic. These alternatives also allow for rainwater to pass more effectively. Remove as much debris and weeds as possible from the flowerbed site. Use hand cultivators or walk behind tillers if the area is relatively small. Any project over half an acre should be professionally cleared of all weeds. Use environmentally-friendly, organic weed control mats to help soil conditions. Some weed mats have pesticides and herbicides imbedded in them that leach into the soil and into the water table. Organic mats simply kill weeds underneath them and actually condition the soil favorably. Arrange the matting in and around existing plants that will be kept. Do not cover any exposed bulbs or root balls to prevent damage to the plant. Stake each corner of the mat once it has been placed, cut and smoothed out over the area to be weeded. Continue placing stakes at 1-foot intervals to firmly affix the weed mat. Apply a chemical or synthetic herbicide to get rid of clove weed. Use a "broadleaf" herbicide and spray only on the clove weeds and not on the lawn. Contents of a chemical or a synthetic herbicide usually include dicamba or MCPP, and more than one application is necessary to get rid of the weeds. Spray vinegar on clove weeds. Take care not to spray vinegar on other plants and the lawn. Repeat the process a few times to ensure the best results. Mow your lawn regularly to about 2 to 3 inches tall. Fertilizing the lawn regularly also helps the growth of "good grass" that naturally tends to kill all weeds, keeping your lawn free from clove weed.